The Harhold Family is an oddity in the Noble Realm, in that they are both Noble blue blood, but profile themselves to be very much like the lower classes. Generally considered the youngest Noble Family which is only on its third generation of titleage, House Harhold quickly made a name for itself by supporting various controversial public figures, as well as taking a forefront in religious conflict in the Anglian and Dragenthal region. Steadily expanding the reach of House Harhold, the current Duke Hengest Harhold has reached an all-time high with informants in every corner of the Regalian Capital, and a reputation for ignoring the law and battering his foes that reaches across the many seas both west and east. Harhold remains the only independent Anglian noble family not directly under control of House Kade (and living on the Anglian mainland), though often falls in line with many of House Kade’s policies, and in many ways acts as their frontline when it concerns Regalian politics. The Duke is often recognized by his signature eye-patch. Nobody knows if he actually needs the eye-patch or whether it is just an accessory. Duke Hengest I Harhold, Duke of Vlissinghelm and self proclaimed Revain of the Zuiderpoort region is the third generation. He was preceded by his father Baron Derck I Harhold, Baronet of Zuiderpoort, who succeeded his 30 year older brother when he died in a mysterious explosive manure related incident. The founder of the Harhold family was Grand Alderman Hendersk Harhold, who was ennobled by Baron Teube II Oolthuis who incidentally also died in the same incident that claimed Hendersk Harhold’s life. Derck I Harhold became Baronet of Zuiderpoort when Oolthuis’s lineage was extinguished, shortly after this family had written an agreement to pass their titles to House Harhold should their ruler die without issue. Hengest later lost the Baronial title held in Zuiderpoort when the New Model Nobility was implemented, but gained the much larger Ducal lands of Vlissinghelm and Gaekraan (the place the Duke was incidentally born, but previously was never ruled by his family). 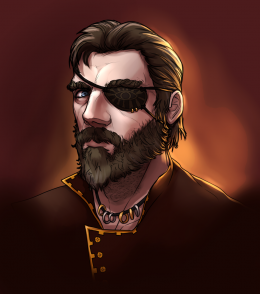 Duke Hengest still maintains the self proclaimed title of Revain of Zuiderpoort, which is a more informal prestige title created to represent the last bastion of Anglian mainland independence, as well as defensive loyalty to House Kade against aggression of the Dragenthal nobles. House Kade had acknowledged the title, but it was never verified by non Anglian nobility, so the title remains useless outside of Anglia. House Harholds land holdings are generally summarized as Vlissinghelm, the major Duchy in Lokinge, but numerous Harhold loyal Barons also have lands in Dragenthal, which makes House Harhold's lands cover both Lokinge and Dragenthal legislations. Despite their cross-region presence, House Harhold's holdings are almost uniquely Anglian and boasts the highest census of Unionists per 1000 population number, namely 99.99%. House Harhold's personal holdings are few and wide in between. The main property from which House Harhold operates is the Volkenburgh in Vlissinghelm, a 1st century Anglian citadel with supporting curtain walls that ring around the city itself. Volkenburgh is described as a dread fort, largely because of its deplorable state. Being nearly 250 years old, the castle is built in the old Anglian style, meaning thick walls and tiny windows that let through very little light, but are practically impregnable for an army without cannons. The castle can barely be identified as a manor or estate and is more often seen as a military stronghold, even if the guards are merely untrained levy peasants from the region. Other Harhold properties are smaller manorial estates that are mostly abandoned for the working periods of the year, only seeing occasional winter feasts and hunting gatherings, remaining closed or used as storage for farming tools, weapons, or agricultural goods. Harhold and Hounds are almost synonymous. Locally, the Duke is often called the Hound Lord. House Harhold, due to the relative poverty of its lands, is not a particularly wealthy family, and is also a relatively new family. House Harhold's finances are largely choked up by the Kade House of Trade which governs the exports of Lokinge through the agricultural monopolies. As such, House Harhold does receive a fair and consistent price for his produce and have a stable source of income, but often finds that they are unable to haggle or worm their way around the pricing for a better cut. Additionally, most of the Harhold production bases are infiltrated from top to bottom by Kade jurists and bureaucrats who keep the House of Trade supplied. House Harhold's military capacity favors quantity over quality, using large levies of fielded peasantry over the presence of Knights, who have mostly avoided House Harhold because of their lacking honorable qualities. That being said, the peasants do fight with a peculiar loyalty that is quite unlike the loyalty of the other feudal lords, who seem very far removed from the daily plights of the serfs and farmers. Houser Harhold's military is as such also strongly attached to their economic throughput. A war, or a particularly disastrous battle with large numbers of casualties, perpetually risk crippling House Harhold's grain production because the troops lost essentially disappear from the work force as well. House Harhold maintains positive relations with their Local Lords, though only because of their simple minded attitude and the low literacy among the Mayors of the realm. Because House Kade bureaucrats take most of the calculus as their tasks, there is never a great need for educated men in Vlissinghelm. Indeed, most of Lokinge is devoid of great centers of learning, anyone who shows a degree of wit immediately traveling south to the Riverland Universities for higher education and never returning. Harhold's Local Lords know that they have House Harhold's economic and military capacity in a choke hold, that is to say, without the support of the Local Lords, House Harhold's fortunes would be nonexistent. Fortunately for House Harhold, the Local Lords are supportive of House Harhold's rascal reputation, and have yet to show any dissent on their master's actions. House Harhold's relations with the Imperial Court are strenuous at best. Under the tenure of Emperor Cedromar, the current Harhold Duke was ridiculed at the court for behaving like a wild animal, and spoken down to for his disrespect towards the privileges of nobility. The Imperial Court continues to abhor the aggressive attitudes of House Harhold, and has mostly shied away from shining any sort of political favor or good faith words for this independent southern house, despite the economic ties between House Harhold and House Kade. Harhold has a strong Cultural Reference with Anglian Bloodhounds, dometic dogs that are almost synonymous with House Harhold and are represented on all family icons and symbols, except on their crest. 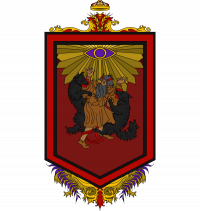 Their crest instead shows Ceardian Wolves, but this is largely because the popularization of the Bloodhound was mostly Duke Hengest’s work, not his father or uncle’s. 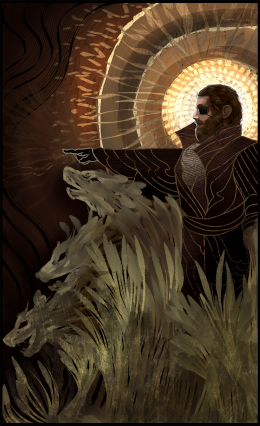 It is often seen that enemies of Harhold make their stances known by hurting animals more than they actually hurt a Harhold themselves, and those that speak ill will of House Harhold target their hound loving-ness more than their actual appearance or political conduct. Indeed, the main way of punishing wrongdoings for House Harhold is also to be torn to shreds by hounds, creatures which the Duke has often praised as being more worthy of affection than the Ailors around him, as well as more devout to Unionism than self-thinking priests. Duke Hengest I Harhold, Duke of Vlissinghelm and self proclaimed Revain of Zuiderpoort. Ex-Principal Secretary of the Black Hand under House Kade, and present Chairman of the Black Hand under the State Council post-Imperial descent, while also being a State Council seat holder. Agatha Harhold, daughter of Hengest Harhold, ex-Minister of the Commons and the People. House Harhold once served under House Montagaard, but when Montagaard collapsed, House Harhold quickly stepped out of their shadows and seized the moment for growth. House Harhold is the only family in the realm which can claim to have a 100% Unionist subject rate. This is indeed only true, since all non-Unionists were chased out of the Vlissinghelm Duchy. House Harhold is frequently dared into court, but somehow never ends up actually being convicted, or indeed ever having to defend themselves in court, as most accusers either disappear, or the justicars dismiss the case before it is even served. This page was last edited on 23 November 2018, at 17:41.